is a northwest horticultural expert: Marianne has a degree in horticulture from Washington State University and writes a syndicated gardening column that runs in over a dozen newspapers each week including the The Tacoma News Tribune (Sundays) and The Daily Olympian (Saturdays). She has also written or co-written 10 gardening books including "Easy Answers for Great Gardens" and her latest book "Edible Gardening for Washington and Oregon" She lectures and gives seminars on a variety of topics. Marianne leads garden tours around the world with her husband Joe. She lives with her family in Enumclaw, near Seattle, Washington. ​Join us in Egypt! The pyramids are waiting. ​Feb 5 -17, 2020 Nile River Cruise to see pyramids plus a few days in Dubai. Call Collette Travel at 800-852-5655 and refer to booking #950748 and they can email you the details or send a brochure by mail. We will visit Dubai after the Nile cruise and there is also a pre-trip option to Jordan. Price of trip is $4,599 and that includes airfare. ​Also in the works, Ireland for Sept 2020 and Nashville and New Orleans in spring of 2020. ..Note: Trips usually fill before announced to the public so you must email us to get on list to be notified when trip details are available. ​Are you flexible? You can also email to be on waiting list to fill in for last minute spots when people cancel. You can visit YouTube and put in my name to see "how to" gardening videos. Want to see videos of my garden? 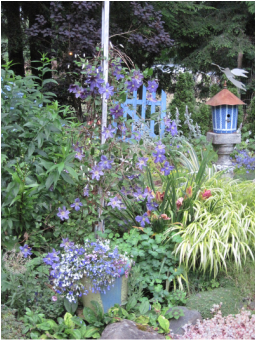 Go to www.plantersplace.com - learn my tips for growing clematis, perennials, and more of my favorite plants. My blue and yellow garden in May. Learn how to have more drama without the drinking problems in your garden. These plants are drought, slug and deer resistant. Many of my talks teach what plants to grow that are the most practical for different climates. Note the blue bird house and blue painted gate in the background. This is because I have trouble growing blue delphiniums - so I use blue paint instead. This is hydrangea "Blushing Bride" and it pokes through the window in my brick wall - keeps the lovely blooms from flopping on the ground. April 9, Tue 6:30pm Gig Harbor Civic Center "Layering the Landscape" free. prizes, snacks, no registration. Bring a friend. 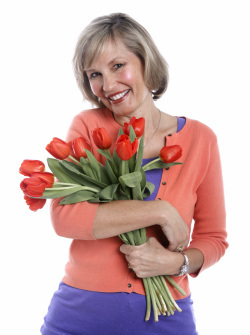 April 13, Sat 11am and 1pm Port Susan Home and Garden Show at Camano Island Port Susan Center on 606 Arrowhead road. Two talks, Color my World at 11am and Layering the Landscape at 1pm. 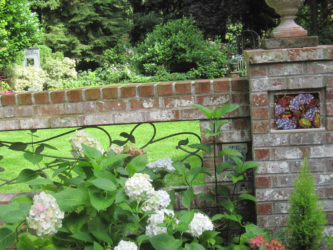 April 16, Tue 6:30pm Kenmore Northshore community center "Knock Out Gardens" Free, bring a friend. April 17, Wed 6:00pm North Tapps Middle School "Naked Lawn Care and Lovely Landscapes" free, learn to lower your water bill and use less pesticides. No registration, prizes, bring a friend. April 24, Wed 6:30pm University Place Tacoma "Garden Solutions from Around the World" free, prizes, bring a friend. May 12, Sunday Herronswood nursery 11am "Plants I have loved" All mothers get to tour the garden for free. 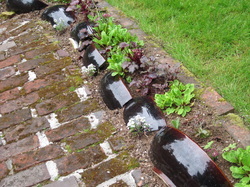 Recycle broken pots as a border along a pathway - a great place to hide some slug bait.